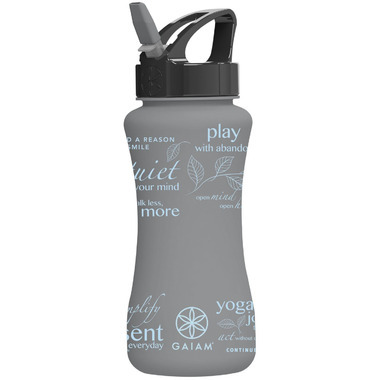 Stay hydrated on the go with this Gaiam EZ-Flip Water Bottle. This water bottle is BPA-free, reusable and recyclable, odour resistant, dishwasher safe and has a capacity of 710 mL! The easy one handed flip top and the ability to place this bottle in your cup holders makes it great for travel and on the go adventures. The Be Inspired print is fun and unique! Poor quality, straw squeaks when you drink and it leaks. It looks nice but that's it! I absolutely love this water bottle. Just fyi, if you leave it in a very hot car it will leak. The flip top makes it convenient, not to mention I just love the way it looks.